From the first works made in the School of Painting, the young artist Andrei Ryabushkin showed a sincere interest in everyday life and life in a Russian village. He linked all subsequent creative fate with the development of this topic. “The street of old Moscow” is one of his mature works. Written in 1890, the canvas shows us an excerpt from the life of Ancient Russia. The painter was interested in everything related to the history of Russia. He first went on a journey to different parts of the homeland, in which he greedily absorbed the surviving samples of past eras. Ryabushkin studied architecture, made sketches of it, visited historical museums and joined the atmosphere of the Russian hinterland, in which ancient national traditions remained unchanged. In the picture, architectural structures are worked out in detail, not less attention is paid to people: their images, clothes. 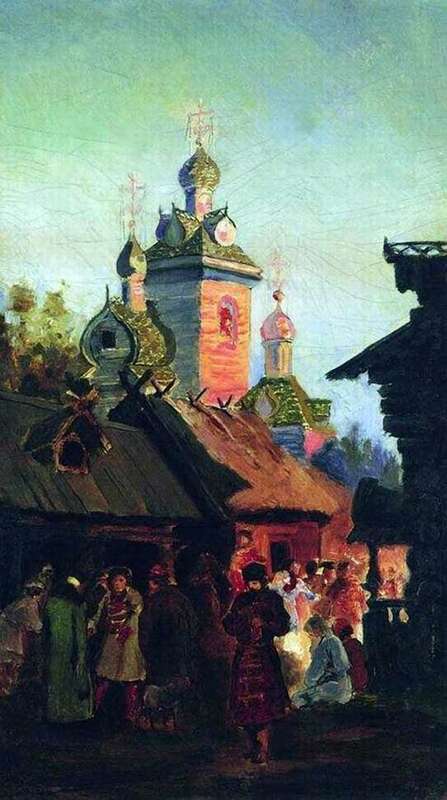 Old Russia in the vision Ryabushkin colorful, united and spiritual. An Orthodox church with many beautiful towers and crosses on them is placed in the composite center of the canvas. The church structure shines in the reflection of the evening glow, and wooden houses are crowded at its foot. An accumulation of people in colorful national clothes – shirts and caftans – disperse about their business. Old men peacefully peered into a fire lit in the middle of the street. Someone has a lively conversation, attracting passing by unwitting listeners. The sky above the street of old Moscow is serenely clear. Green tops peering through the houses allude to springtime. The Russian painter enthusiastically admires the life of old Rus, its colorfulness, simplicity and elegant decoration. He paintings “Street of old Moscow” breathes warmth and comfort. It seems as if the heat of the fire depicted on the canvas comes to us, the spectators. And then pride in the heart of the country, love for her and quiet nostalgia is kindled in her heart.